This black and white photograph shows a group of men at the Granada Theater in Lawrence, Kansas. 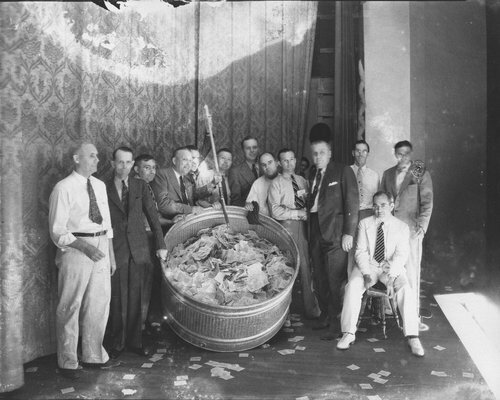 The men are gathered around a stock tank containing entry forms for the chance to win a free 1936 Chevrolet Town Sedan valued at $677 from Winter Chevrolet Co. The wining entry announced at 9:00 p.m. was Donny Dowers of 1704 Mississippi Street, Lawrence.